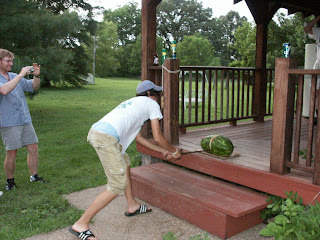 How Memorial Weekends used to be spent, cutting watermelons with Blackbeard's cutlass. As many know (they've been bombarded with tales of sea-serpents, hurricanes, and desert islands) we had a tumultuously busy weekend over the Memorial Holiday. I am just now starting to recover to the point I won't scowl at every new patron who visits the HypnoVessel. The weekend left me regarding strangers who boarded the ship with disdain normally reserved for the Dutch. Having admitted my mental exhaustion, thanks to the many kind folks who wore me out. I was afraid Cade would go AWOL, but he's a tough old salt and returned this week for more duty. The volleyball court is inching closer to completion. Soon it will be a funny scene with locals fighting their way to volleyball dominance. Also inching closer is Highland Prospects; Ben's bike frame, tires, and bike stand made it over and the shop is starting to look like Ben's college dorm or storage facility. Hell, maybe Ben lived in a storage facility during his tenure at D & E? Also getting closer is the election (June 9th). Don't forget your friends, Summer, Cindy, and Jeremy are running. Also on the ticket is volleyball court constructor Phil F. He's a good fellow with a great eye for sand-related sporting grounds! Who can vote? When, where, WHY?